La primavera (Spring) is here and as we say in Spain, la sangre altera (Spring heats your blood). Nature undergoes a lot of changes. 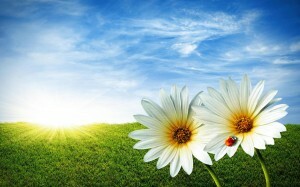 Trees blossom in the forests; roses flower in the gardens and daisies bloom in the meadows. However, these are just the good changes; there are also plenty of weather disturbances in Spain: rain, wind, and low pressure are jumbled with sunny and clear days. Today, we’ll learn some slangs about weather expressions. We are going to focus on two of these natural phenomenons: el viento (the wind) and la lluvia (the rain). Pregonar / Gritar a los cuatro vientos (literally, proclaiming or shouting to the four winds): telling everybody some news, which make you happy. Mi madre pregonó a los cuatro vientos que había aprobado mis exámenes (My mother told everybody I had passed all my exams). Ir viento en popa (literally, the wind on the stern): A project goes well. Nuestra empresa va viento en popa (our company goes really well). Estar en el ojo del huracán: (literally, to be in the hurricane’s eye): to be in the spotlight because of a difficult situation. El primer ministro está en el ojo del huracán debido a un escándalo económico (the prime Minister is in the spotlight because of an economical scandal). Ir contra viento y marea: (literally, to go against the wind and the tide): to have everybody against you. Decidí divorciarme y desde entonces he ido contra viento y marea (I decided to get divorced and I’ve fought against everybody since then). Llover sobre mojado (literally, to rain on a wet ground): A difficult situation that happens, not for the first time. Mi amigo volvió a perder su móvil; llueve sobre mojado (My friend lost his cellular again; it always happens to him). Ha llovido mucho desde entonces (literally, it has rained a lot since then), It’s a long time since then. Mi padre jugaba al fútbol pero ha llovido mucho desde entonces (my father used to play football long time ago). Aguantar el chaparrón (literally, to stand the rainstorm): To stand a reproach or an argument without responding. El marido llegó borracho a casa y aguantó el chaparrón como pudo (The husband could stand the argument as he could when he arrived home drunk). Como quien oye llover: (literally, as who hears the rain): to ignore, not to pay attention. Cuando el professor le habla él siempre hace como quien oye llover (when the teacher speaks to him, he never pays attention to him).